Wearing the charms and eccentricities of Wes Anderson on its sleeve, THE BROTHERS BLOOM is a classy indie crime caper and the second feature from head-turning filmmaker Rian Johnson (BRICK). 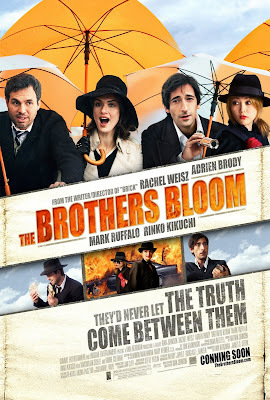 Adrien Brody (THE DARJEELING LIMITED) and Mark Ruffalo (SHUTTER ISLAND) pair up as the dysfunctional Bloom brothers, an orphaned sibling outfit who lay claim to being the best conmen in the world. As the kings of their game, the brothers rejoice in leading a dishonest life, swindling the rich with their dashing charm and guile. But Bloom (Brody), growing restless and itching with discontentment, shies away from the fraudulent lifestyle. Until, that is, Stephen (Ruffalo), the elder of the two, convinces him to take on one last job.